The internet is like preschool. Tell the kids to stop bouncing off the walls and they're going to openly mock you. And then probably send you a Harambe meme. That's the problem that the Cincinnati Zoo has encountered amid a deluge of Harambe memes that are as likely to stop as a Phish concert. Since the killing of the gorilla Harambe after a four-year-old fell into the gorilla's pen back in May, the zoo has basically seen non-stop Harambe memes flooding its social media accounts. Monday, zoo director Thane Maynard made the mistake of asking the internet to stop. While he was totally justified in doing so, the world has a zero percent success rate when telling the internet to stop doing anything. The influx of Harambe memes in response to the zoo's pleas has forced the zoo to close all of its social media accounts. Over the weekend, Maynard's personal Twitter account was hijacked by a hacker called "Prom." Prom posted many a #JusticeForHarambe tweets from Maynard's account, and that might have been the last straw. The zoo posted a message stating "we are not amused," and you can guess how the internet responded. The full statement read, "We are not amused by the memes, petitions and signs about Harambe… Our zoo family is still healing, and the constant mention of Harambe makes moving forward more difficult for us. We are honoring Harambe by redoubling our gorilla conservation efforts and encouraging others to join us." A tidal wave of Harambe jokes and memes followed, and that's when the zoo decided it was time to shut it down. 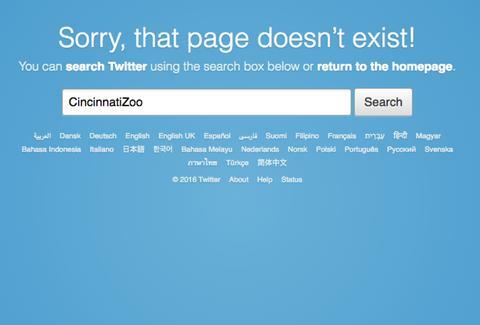 The Cincinnati Zoo Harambe'd its Twitter account. There is no limit to what they might Harambe. The zoo was in an unenviable position. Generally, an organization can join in the meme-ing and that's usually the meme's swan song. But given the situation, that wasn't really an option for the zoo. The meme is both hilarious and offensive, and that's part of why it has managed to last much longer than a meme's usual lifecycle. However, there's a line between making a GIF of Vin Diesel driving next to Harambe at the end of Furious 7 and harassing some communications staffer or intern at a zoo. The latter is unpleasant for someone who probably doesn't deserve the relentless ribbing. Shutting it down might have been the zoo's only option, and that's unfortunate for an organization that lives and dies on donations. Hopefully, the zoo can rejoin a Harambe-less internet some day, when the next thing comes along. Maybe that thing will be something more deserving of endless ridicule, like Ryan Lochte.